You may not know it, but Bangkok has the longest name of any city in the world. It is (be prepared!) Krungthep Mahanakhon Amonrattanakosi Mahintharayutthaya Mahadilokphop Nopphosin Ratchathaniburirom Udomrathaniwetmahasa Amonphiman Awatansathit Sakkathatiya Witsanukamprasit. So what does this mean in English? City of Angels, the Great City, the Residence of the Emerald Buddha, the Impregnable City of Ayutthaya of God Indra, the Grand Capital of the World Endowed with Nine Precious Gems, the Happy City Abounding in Enormous Royal Palaces That Resemble Heavenly Abode Wherein Dwell the Reincarnated Gods, a City Given by Indra and Built by Vishnukarm. This is really too long to say when referring to a place, so Thais just use Krung Thep. This means City of Angels. Most farang or foreigners just call it Bangkok. Bangkok began as a capital with canals (in fact, Bangkok used to be known as Venice of the East) that stretched throughout the city where a person could see elephants every now and then. Elephants are now illegal in Bangkok, so if you want to see one, you won’t find one in Bangkok (Maybe at a zoo). Today Bangkok is a metropolis, with around 15 million people living in it. Traffic is bad and can be expected to get worse. The city is one of modern skyscrapers and business. The statistics can have error. Bangkok started to sprout around 50 years ago, when the construction on the mighty Asian capital began. With economic growth opportunities and tourism Thailand is not over urbanized, there is still lots of free land left in the country. For example, Thailand’s second largest city, Chiang Mai in fact, is 40 times smaller than Bangkok. Before Bangkok became one city, it was actually two separate cities. Thonburi on the west side of the Chao Phraya and Bangkok was to the east of it. In the 1970’s, Thonburi and Bangkok became one, they were united to form a single city. Not only was Bangkok united with Thonburi, it was merged with two provinces. 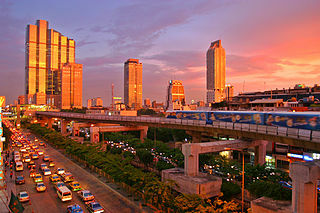 The metro area of Bangkok is around 600 square miles. Bangkok is about 31 miles from the Gulf of Thailand. Bangkok rests west of Thailand’s Chao Phraya River. If you live by a major city and you get stuck in traffic and think it is bad, it is nothing compared to Bangkok’s. The speed of traffic is comparable to walking speed. Several attempts to relieve traffic have been taken. Mass transit is the focus with the skytrain and possible subway on the way. Since Bangkok is on top of an alluvial plain, it is flat and in fact it is sinking 10 centimeters each year. In the heart is the royal center known as Rattanakosin. This is an artificial island that has included, most of the principal royal and religious architecture. Bangkok’s official center is Lak Muang which is a gilded pillar that was placed by Rama I. The Grand Palace has about 1.5 squre kilometers of ground and is open to visitors. Visitors must dress properly and respectfully. The Grand Palace was created by Chakri in 1782, ever since, almost every king has added to it. The king does not hold home to this area, King Bhumibol lives in Chitralada Palce which is located in the Dusit area. The Grand Palace is not just a place to tour, it still holds use for official services. Getting back to transit, Bangkok’s congested areas have up to 25% more pollution than the city safety standards. 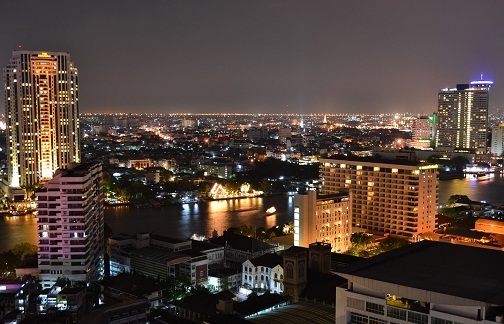 Bangkok allows up to twice the carbon monoxide level than any city in the United States would deem unhealthful. Bangkok has plenty of shopping, modern malls with stories of shopping. An urban escape in the city is cental Bangkok’s one park, Lumpini Park. This park appears large and is like Central Park in New York. Bangkok is a wild and modern city where past meets present and temple meets skyscraper. Bangkok is about 40 times larger than Thailand’s next largest cities of Chiang Mai and Nakhon Ratchasima.